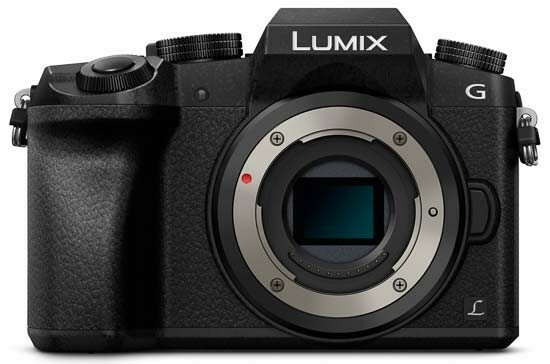 The Panasonic Lumix DMC-G7 is the fifth Panasonic stills camera to offer 4K video and photo shooting, following in the footsteps of the GH4, LX100, FZ1000 and CM1 models. "Introducing 4k to everyone" is the marketing angle that Panasonic are taking with the G7, and we'd agree that this DSLR-like, mid-range compact system camera is the best suited of all those products to expand the appeal of 4K to a wider audience, especially as it now offers additional 4K photo modes. Even if you're not onboard the 4K train, the DMC-G7 is still a very appealing mirrorless camera, once again offering a lot of features and performance at an attractive price, although it lacks the more characteristic retro styling of the Olympus PEN range or the Fujifilm X-series. With a more angular design than its predecessor, the DMC-G7 again falls into the mini-DSLR category of compact system cameras, complete with an excellent electronic viewfinder, LCD screen, and both a pop-up flash and a hotshoe. The addition of the drive mode dial and not one, but two control dials all help to improve the DMC-G7's credentials as an affordable camera for enthusiasts that delivers a lot of bang for your buck. Image quality has also been improved since from the previous DMC-G6 (as this new model uses the same sensor as the excellent DMC-GX7), in particular moving things on in the ISO stakes. Images shot at ISO 100-1600 are clean, with a little noise appearing at 3200 and more at the still very usable setting of 6400. ISO 12,800 is best reserved for resizing and smaller prints, while the top speed of 25,600 is really only for emergency use, but overall the G7 offers outstanding still image quality for a Micro Four Thirds camera. Coming across like a mini-GH4, the Panasonic Lumix DMC-G7 is a great addition to the Lumix CSC range, offering 4K video recording and useful 4K/8 megapixel still modes at a price-point that only the similar Samsung NX500 can match.